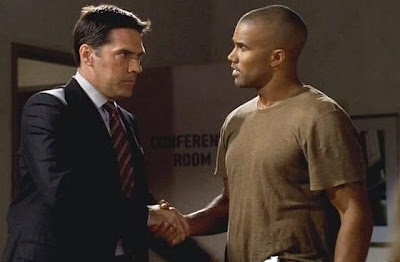 Loving Moore: CRIMINAL MINDS ~ A Rift Between Morgan and Hotch? Aaron Hotchner and Derek Morgan in friendly times. Entertainment Weekly was on the CRIMINAL MINDS set yesterday (August 4), talking with the cast, and showrunner, Erica Messer. Messer gave EW some insight about how the team was going to react to Prentiss' return from the dead. It is not surprising that Morgan would be deeply affected. He and Prentiss (Paget Brewster) were most often paired off in the field, and he was with her when she lay dying. Will this cause between Morgan and Hotch? Many of us on the LOVING MOORE AND MORE Message Board felt that Morgan should have been privy to the truth because of their close relationship. Unfortunately we have to wait forty-seven days to how the drama plays out. Season 7 premier is Wednesday, September 21.